BIGGEST INFLUENCE: "Tiffany Chen, Emily Stites, Fresh Sausage Specialist." One of Cincinnati's top Div. 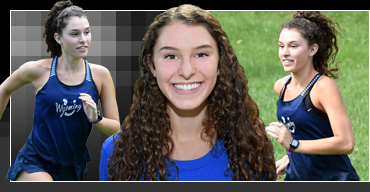 II runners is Wyoming senior Riley Bahr, a four-year starter in cross country and track. In cross country, Riley so far this season has the CHL's top time in cross country (19:46). She helped lead her Lady Cowboy squad to last season's CHL and SWO District Div. II championships. She won the individual CHL title for the second time in 19:06.00 and won the SWO District title in 19:22.37. Riley three times has been named CHL Cross Country Runner of the Year and first team all-conference. She was also named first team all-city (Enquirer) for the second time. Last spring in track & field, Riley was the CHL champ in the 3200 run in 11:48.11, helping her team to a league runner-up finish. She was also a member of the 4x800 relay team that won the CHL championship in 10:06.34. She repeated those titles in the SWO District championships, and was named first team all-CHL and first team all-city. A super student (4.4 GPA), Riley will run at the next level, but has not yet selected a college. Her favorite athlete is Cory McGee, favorite entertainer is Frank Ocean, favorite book is How Bad Do You Want it? favorite movie is Coco and most-like-to-meet is Rachel McArthur. COACH'S QUOTE – "Riley's an outstanding athlete, captain, and person. Everyone around her benefits seeing the example she sets at practice, in meets, and in life outside competition."